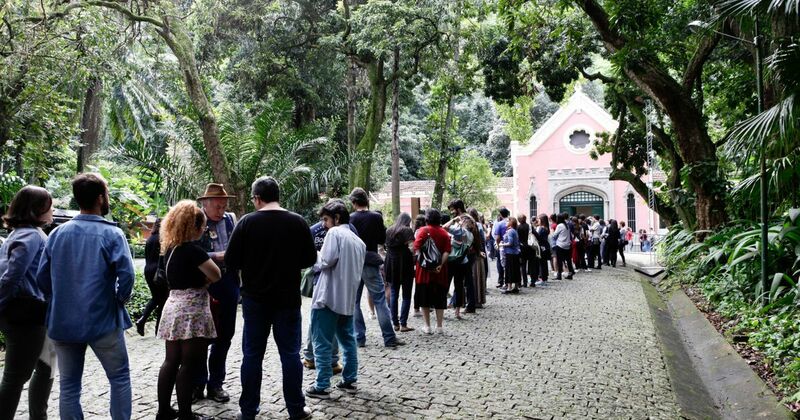 An exhibition of queer art in Brazil that was shut down after conservative complaints reopened this weekend at Rio di Janeiros private School of Visual Arts of Parque Lage to large crowds. Queermuseu, which includes works by artists like Lygia Clark and Adriana Varejão, was removed from the Santander Cultural Center in Porto Alegre last year. The show was among a string of incidents of censorship condemned last October in an open letter by Brazilian artists and art professionals, who complained of “the rise of hate, intolerance and violence against freedom of expression in the arts and education” in the country. It was revived thanks to one of the countrys biggest crowdfunding campaigns, which raised more than one million reals, or $250,000—far more than the stated goal of $5,600. Fabio Szwarcwald, the school's director, says that the 5,000 visitors who came to the opening on Saturday and the 3,000 who came the following day also set a record for weekend attendance at the venue. The wait time to enter the show was about an hour and half. Szchwarcwald called the mayors comments “absurd”, adding: “We cant allow someone like him to decide what we see or not”. He cited the schools history of resistance from its founding during military dictatorship in the 1970s as one of the reasons it was happy to take the show. Gaudencio Fidelis, the shows curator, called the opening a “celebration of democracy and resistance” in face of the “fast growing fundamentalism and fascism” that he says is threatening to topple the countrys young and “fragile democracy”. By: PTI | Mumbai | Published: November 11, 2018 3:23:3.. The Umma Mace-head, Early Dynastic period, c. 2400 BC © J.Fernandes. Courtesy of the Trustees of the..